We’re laid out on futons on the floor with no more than a bag of buckwheat for a pillow and barely a millimetre between the six of us. Welcome to Japan. The traditional lodging is far from luxurious, but after getting up and stretching out those squished muscles, it actually feels surprisingly good and sure beats the previous night sleeping on the plane. 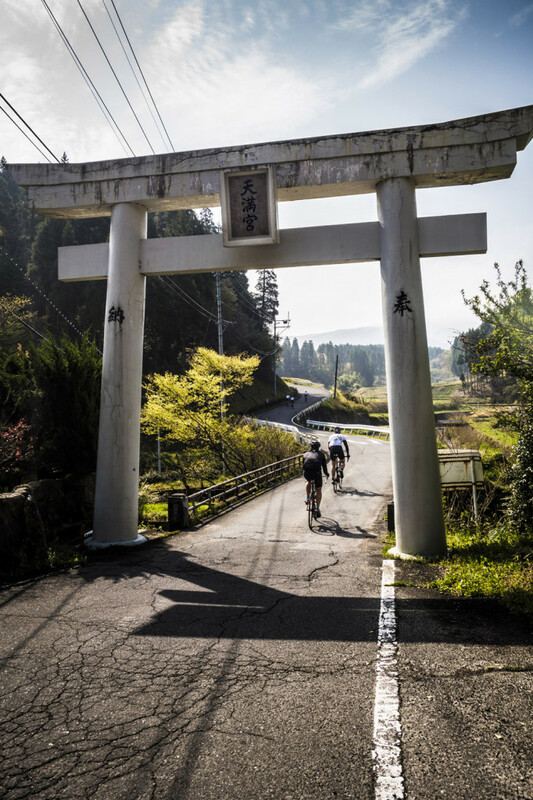 We’re in Japan for the Rapha Gentlemen’s race, part of a series of unsupported, unsanctioned sportives organised by Rapha all around the world. 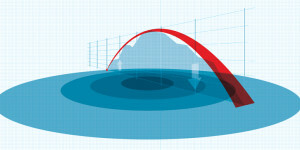 The first event was held in Portland, Oregon in 2008, and the format is team-based with a number of checkpoints along the course. 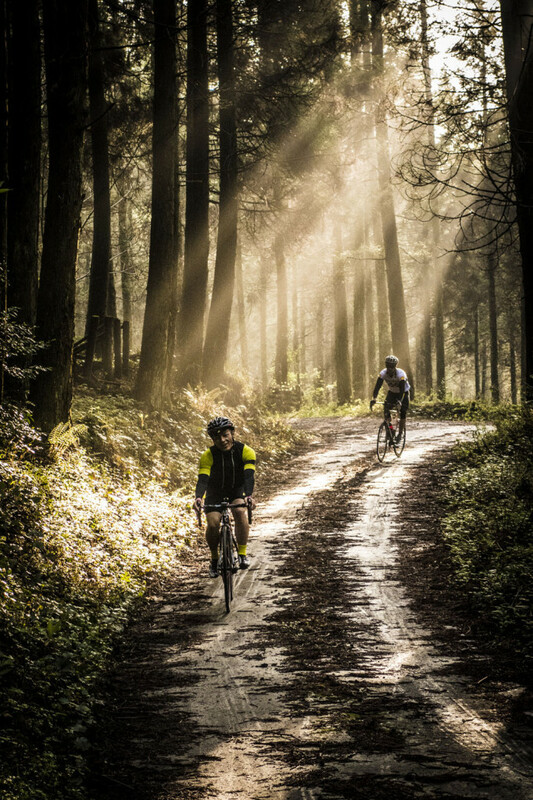 It’s called a race, but it’s more about having a good day out and exploring the road less travelled. Our team, consisting of six Aussies, has been named the Ned Kelly Gang (though I’m the only beard!). Others include the Panasonic team (on Japan-made Panasonics); Peugeot (British and Aussie); 25 Las (complete with bandana-inspired kit); and Gali-beer (in matching Galibier jerseys). There are 20 teams in total. 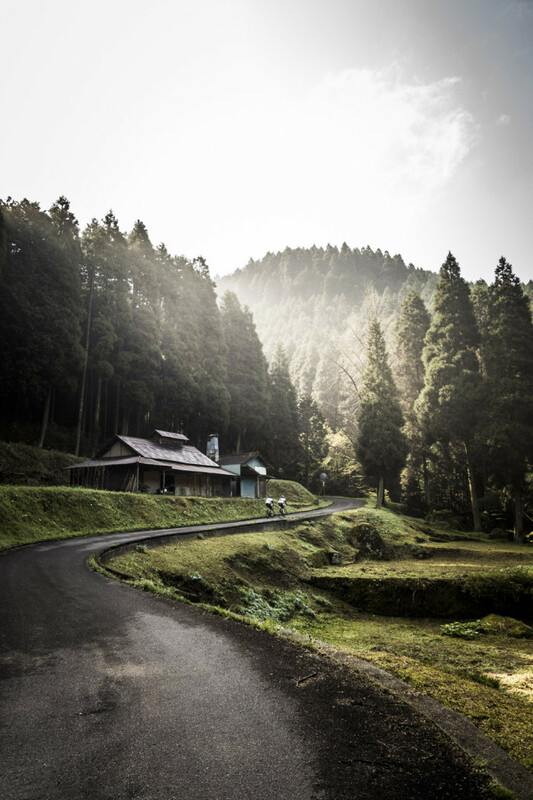 The course is in and around Oguni, a small rural town situated in an undulating landscape of dense pine forests and rich farmland. This is on Kyushu, the most south-western of the four islands of Japan, roughly half the size of Tasmania but with over 13 million people – not many of whom live in Oguni. Kyushu, like most of Japan, is rich with volcanic activity and is home to the country’s most active volcano, Mount Aso, which last erupted in 2011. Thankfully, it hasn’t had a serious one for about 90,000 years, though smoke pours out constantly making it look imposing nonetheless. The bonus of being in volcanic lands is that wherever you go you’ll find hot springs or onsen (traditional Japanese bathhouses) heated with volcanic ground water. As we arrive at the start line the sun is peeking over the jagged horizon just in time for our departure. Being the official photographer for the team, my camera is out before we even round the first corner. Such a role is a double-edged sword, though; you have to get ahead of the crowd, stop every 100 yards, take photographs in a split second – there are no second takes – and then chase the riders again. Taking photos on the bike gives a unique insight into cycling, but it has its difficulties. Using a small yet very high-quality compact camera is the best option; it’s kept out of harm’s way inside a small case strapped to the top tube. That said, I’ve had a camera come out before while riding and it was completely destroyed. Shooting with one hand and steering with the other is fine on perfect tarmac, but when the road gets rough it gets tricky. I’m busy capturing the early morning light as it creeps across the ornate rooftops of the farming villages when my team-mate calls “Wrong way! Wrong way!” It’s not long before the next team has caught up and we decide following might be a good idea. 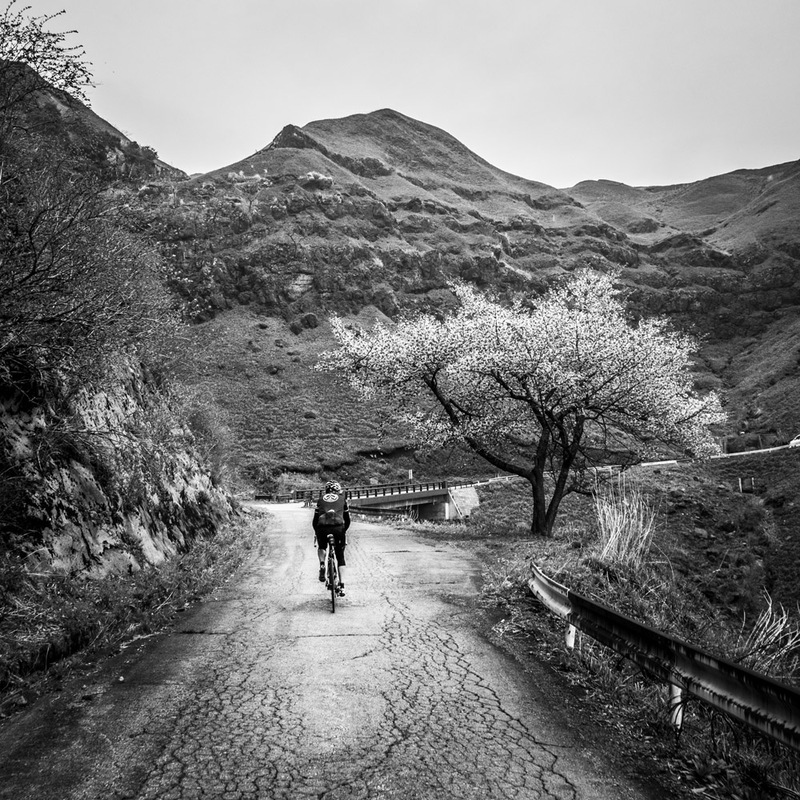 The first 20km takes us on winding roads through small rural villages, over bridges and through narrow forest roads. The air is damp with a thin veil of mist hanging between the trees. Sun is filtering through in defined beams like hundreds of searchlights illuminating the moss, which is doing its best to consume the roads. This is farm country and vehicle traffic is scarce, but amazingly we’re on sealed roads and the surface is fantastic. 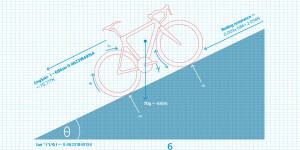 We encounter plenty of steep gradients and the combination with overly smooth surfaces makes traction out of the saddle difficult. It isn’t long before we take another wrong turn (GPS isn’t the answer to everything, it seems). 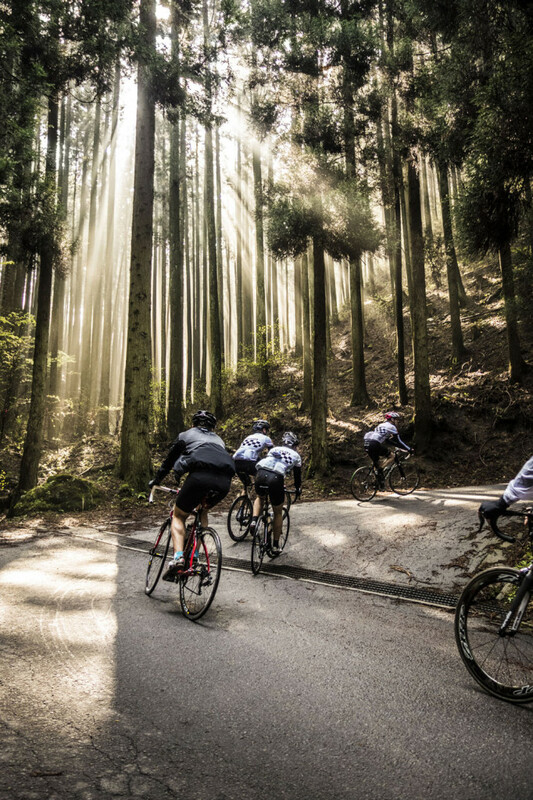 Backtracking we come across a bunch of 10 Japanese riders from two different teams. After swapping cameras and taking a couple of cyclist selfies (much cooler than Facebook trout pouts), they show us the way; unfortunately, the way is a brutally steep section that looks more like a disused driveway than somewhere fit for road cyclists. 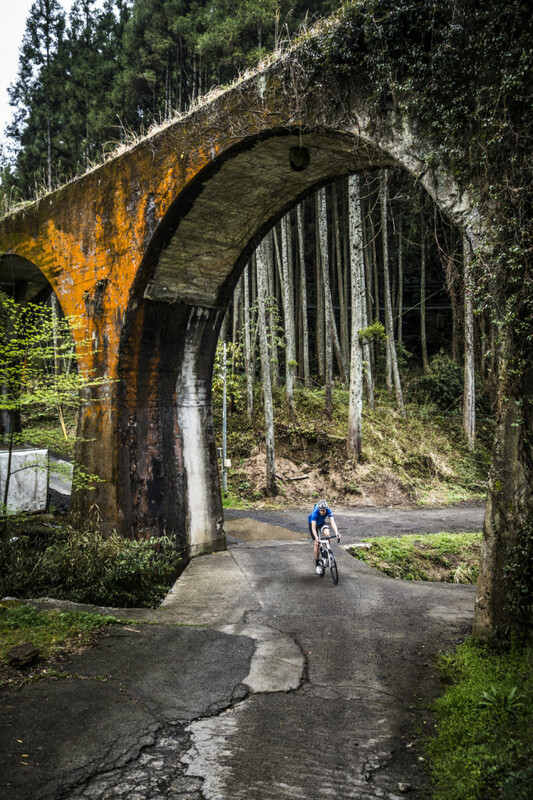 The first section of gravel is up next and, as it turns out, it won’t be the last – gravel is popular in Japan, it seems. As we pick our way through the worst of the loose stuff, a car comes alongside, the door swings open and the videographer jumps out and runs next to us capturing a bit of footage before hopping back in the car to find the next spot. Seems he has the easier job today, but you don’t get the same experience on four wheels as you do two. Stopping again to capture some descending riders, my team rides on without me. Up ahead lies a deep, muddy section of road, which riders negotiate with bikes on shoulders, cyclo-cross style. Ploughing straight through the middle, the mud flies everywhere, and those who manage to get to the other side without going down draw cheers from the other riders. Some were not so fortunate in their attempts – it’s like a round of Takeshi’s Castle with wheels. Straight after the mud is a section nicknamed the Rock Garden – more suited to a mountain bike than a roadie. After attempting a “faster is smoother” mantra that nearly ends with a trip into the bushes, a slow and steady pace is taken across the clustered, cobble-sized stones with broken branches and gravel in between. The view over the next descent is amazing with pine forest below and Mount Aso looming in the distance. It flashes past and it’s not long until the next farm road. The teams bunch up now and I spot the Panasonic team. They’re all riding beautifully crafted Japanese steel frame Panasonics. 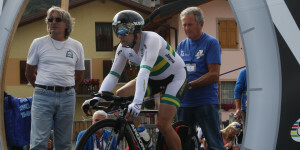 One of the riders has a cowbell on his handlebars that clangs as the bike sways up the hill. After two hours of riding we reach the first checkpoint with about 30 riders milling around. Not realising this was going to be an all-day ride, the rice-ball stash in my pockets feels a tad inadequate. A banana and chocolate croissant remedies the situation. As I look over the time sheet at the checkpoint I see that my team passed 20 minutes earlier, so there’s little chance they’ll be seen before the finish. I’ll be stopping again, and unlike the motor-assisted vehicles, the gap is simply too much without a shortcut. The checkpoint staff stamp the brevet card and this time, joining the Peugeot bunch, I roll down the next hill. They’re mostly British expats and are the only other non-Japanese team. Most work in Tokyo and we happily chat about riding in and around the city and what life is like in Japan. The chats come to an abrupt end as we start to climb again. I stop to take a photo as 25 Las comes by; their last rider is being pushed by his team-mates. Below his hand, printed on his shorts, are the words ‘Too Slow’. Not long to the top and we’re descending again. As we wind our way back down we notice puffs of steam coming from the hill opposite. Upon closer inspection there are more and more of the little clouds whisping up amongst the trees. The residents of this small village use hot volcanic water in their homes and, as a result, steam spews from the dwellings as if ablaze. We round the next bend encircled by white clouds rising from everywhere. The smell of sulphur is strong. Further on we spot one of the teams stopped for ice cream. Breakfast of rice balls seems a long time ago, but it isn’t too long until the next rest stop. This time it’s a vat of cold green tea with a little sign where the only English words are ‘Rapha – from Cafe Forest Bear’. The tea spot is perfectly positioned to watch passing riders attack a steep gravel rise. Many need to walk their bikes after getting bogged, while a team on cyclo-cross bikes comes through to make short work of it. As we emerge from the dense forest the landscape changes dramatically. Charred trees and blackened grass allow for a sweeping view and glimpses of distant mountains. Standing at the top of a rise waiting for the rest of the team, a white van approaches. It’s Hiro, one of the organisers who picked us up from Fukuoka Airport the previous day. ‘Where’s the rest of your team?’ he asks. ‘I haven’t seen them since the beginning.’ He thinks they could be lost as no one else has seen them either. Getting a bit worried, we load my bike in the van and set off to look for them. After about 10km we spot the photographer from earlier and ask if he has seen them. He hasn’t. We decide they’re either much faster than the other teams or were lost along the way. Hiro goes ahead alone to the next checkpoint to look for them. Left stranded without a GPS, waiting for another team to come past is my only option. Soon a team arrives and we come upon the edge of the sunken crater that surrounds Mount Aso like an ancient city wall. We see the road zig-zagging all the way down. As we descend, the vegetation becomes dense and white cherry blossom petals litter the ground like snow. Moss starts to creep back on the edges of the road. The base of the volcanic caldera is dominated by farmland growing crops on the flat plains of dark, nutrient-rich soil. In the town of Aso, we decide to stop for lunch where the convenience store has plenty of Japanese energy food. We stock up with more rice balls and a tray of inari (deep fried tofu wrapped around sushi rice) washed down with a can of coffee. After fuelling up we get back on the road for the flattest part of the ride. The road is nothing more than a built-up mound of dirt between fields. Bashing along the dirt road at 40km/h to catch up, I’m promptly halted by a rear pinch flat. The team disappears into the distance. Stranded without a pump, there’s nothing to do but signal to the others ahead, hoping they look back. Eventually they see arms waving wildly from the middle of the open plain and ride back to assist. Back in the race, the final ascent looms and it’s not long before we’re above the tree line. Looking up, we make out the guard rail on one of the final corners. 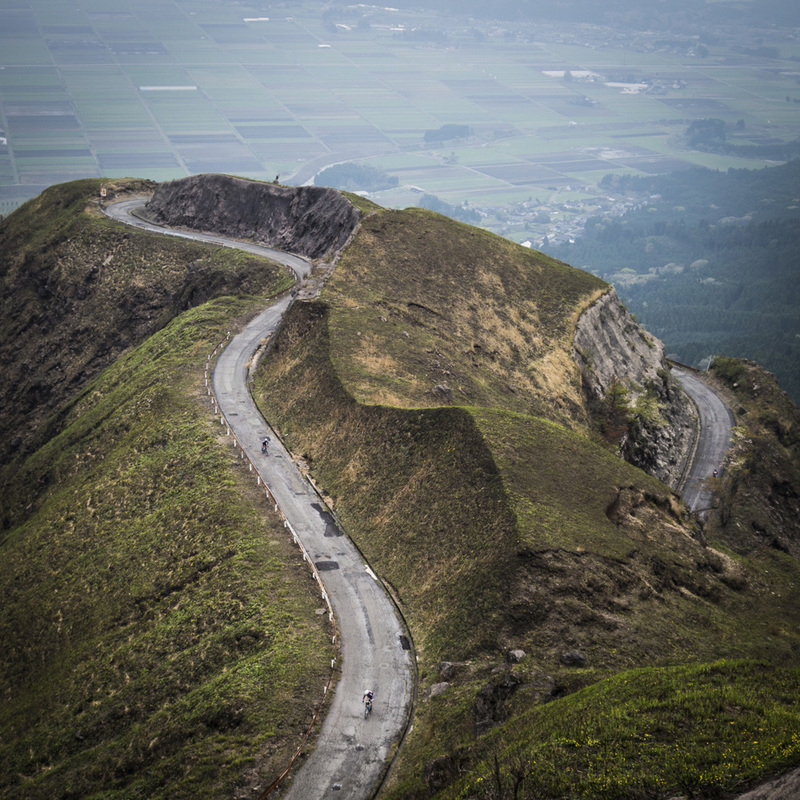 With 110km in the legs and a steady gradient of 9%, the 5km to the summit takes longer than you’d expect. Searching for another gear and looking over the shoulder, another rider is battling up the climb on a single speed. We make it to the summit and waiting at the top is the rest of the apparently lost Australian team. Swapping stories as we set off together to the finish, they tell of seeing a white van speeding past while eating lunch – we burst into laughter, realising we had missed each other. Finally together with 30km to go we get a nice pace-line going. The road is super smooth with beautifully cambered corners. At this rate we think we’ll be at the finish in under an hour, but with 10km to go we’re diverted to a disused rail line. The tracks are gone, the surface is bumpy and up ahead is a tunnel. It’s pitch black, but we notice there are lights, so there must be a switch. Sure enough with a ‘click’ the tunnel is lit; on reaching the other end there’s a switch to turn them back off. A welcome party cheers as we finally cross the finish line, and it’s not long before we each have a beer in hand. 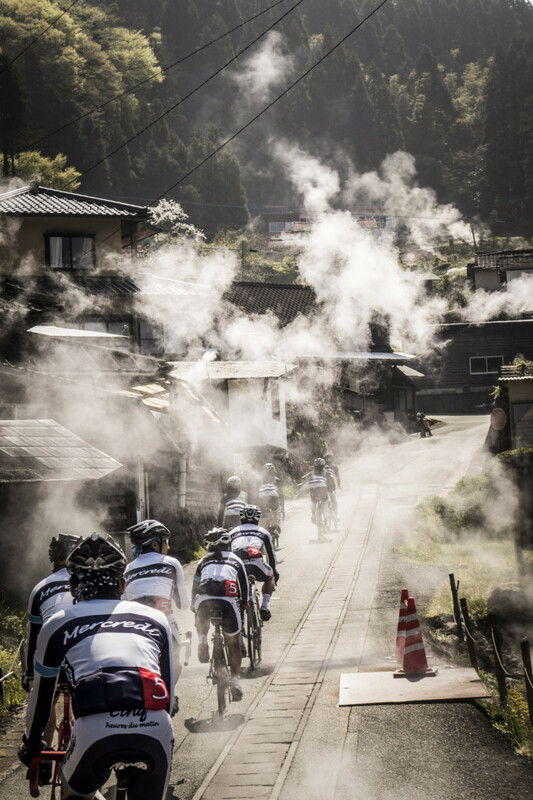 Tired and dirty, it’s time to hit the onsen – kit off, rinse down and into the 45-degree water. Later that evening, once the last of the teams has rolled in, we’re treated to an amazing buffet of tempura shitake, miso soup, chicken katsu and curry. The traditional wooden dining room is bursting at the seams with over 120 riders. Teams have been asked to bring a selection of their favourite beers. These are laid out on a table and we pick a couple. As the beer selection gets smaller, the cheers get louder. Our team is called up to receive our fifth-place prize to the sound of Kanpais (cheers) as beer bottles are thrust into the air. Looking around at the people that shared this amazing event, we thank them as best we can. Even though we don’t speak the same language, we all share something special – a passion for riding that knows no barriers.